American Audio 14MXR939 14" DJ Mixer DJParts - All Variety of Parts that DJ Needs. 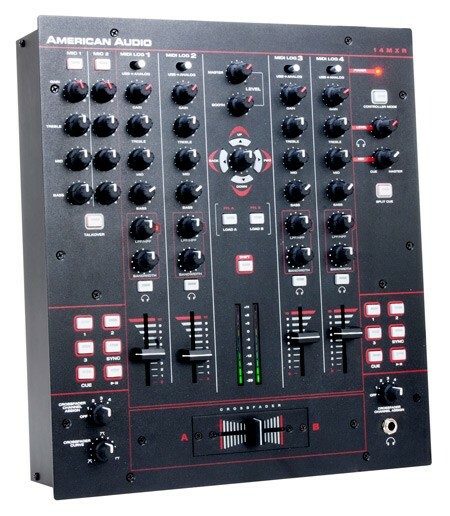 The American Audio MXR Series offers DJs the tactile feel and operation of a traditional DJ mixer while playing and controlling music from software on their computer. The 14 MXR is a 4-Channel MIDILOG™ Mixer with Midi/Analog control, built-in DSP D-Core Sound Card with 4-In/4-Out audio interface, Balanced XLR Outputs, MIDI Navigation Controls and user assignable control buttons to make it easy to customize and play your music. Specifications: • 14-inch, 4-Channel MIDILOG™ Mixer (compatible with any “Midi Learn” Software or Analog Inputs – such as CD Players, Turntables, etc.) • Inputs: 4 Line, 2 Phono, 2 Mic • 20 On-board Midi Control Buttons (Mapable) • MIDI interface (USB MIDI I/O) • Built-in DSP D-Core™ Sound Card with 4-In/4-Out audio interface • Controller Mode: When activated USB output streams are routed through master and headphone outputs • Balanced XLR Outputs • 3-Band EQ with Rotary Kills (Treble, Mid & Bass) • Midi Navigation Controls to allow easy software navigation of your music library • Crossfader Curve Adjustment • Crossfader Channel Assign • Master, Booth, Headphone Level & Mix Controls • Microphone Volume Control, Talkover + 3-Band EQ (Treble, Mid & Bass) • Low/High Pass Filter with Bandwidth Control per channel • 10 segment VU meter • Audio inputs: RCA • Microphone inputs: 2x Balanced ¼”/XLR Combo • Headphone input: ¼” Stereo • Multi-voltage operation: AC 100V~240V 50/60Hz • Dimensions (LxWxH): 14.25”x13.75”x 3.5” / 356x320x85mm • Weight: 10 lbs. / 4.5 kg. Specifications to change without notice.